The Best Buffalo Birthday Parties! Are you planning a birthday party? We specialize in children’s birthday parties and we can take care of all of your party planning needs! We are home of the ‘No-Hassle’ Birthday Parties…don’t worry Mom & Dad, let us do all the work! We love the sound of laughter and the sight of big smiles on everyone’s faces, and having a birthday party at Adventure Landing will give you plenty of reasons to smile, like fun activities, great food, and hours of entertainment. Relax, Mom and Dad, and let Adventure Landing do all the work. A trained party captain will be at your side to help organize and host your party from beginning to end. Adventure Landing Birthday parties are guaranteed to be memorable and affordable. 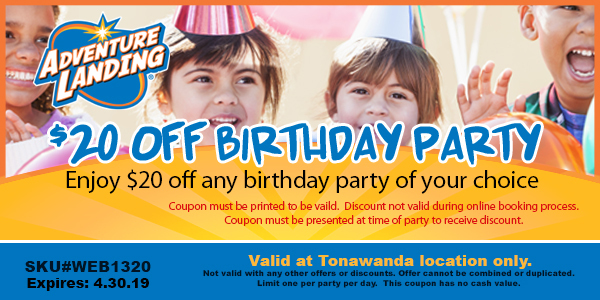 So check out our Birthday Party Package options, and let Adventure Landing be your first choice for your next Birthday Party! Plus, get DOUBLE TOKENS for each party guests when you book your party to be held now through April!